I created a script for Paragaon Mananger 11 (attached), however I am having a problem in loading hdm.dll; all the files have been copied to the build and the appliation splash screen (launcher.exe) starts up with no problems. However when I select one of the option of the splash screen it give me an "could not load hard disk manager library (hdm.dll)". the dll is in the applications folder. do i need to do something special to load when livexp loads? Forgot to add that when i try to register the dll within Livexp I get the following error Load Library error. Is there a script for this app? or does anyone know the problem? you missed at least 2 files in System32 folder. Use installRite2.5 and search which files and registry entries are needed. You can download InstallRite 2.5 as following link. Paragon Hard Disk manager is a product. Paragon Partition Manager is another product. There should be .scripts around for older version, most probably by reviewing them you should be able to find the issue. It is possible that that .dll needs to be registered. I think it has to do with the dll registtration just like Wonko suggest. I imported all the registry entries and have verified that they are in the livexp registry. I am doing something wrong,, have i missed a step? Thanks for all the assistance! It may also be related to some sub-system not running in the PE, like (just examples - don't take my word for this - WMI or VSS). Maybe running Dependency Walker and profiling the app (once in the "working OS" and once in PE) may help. 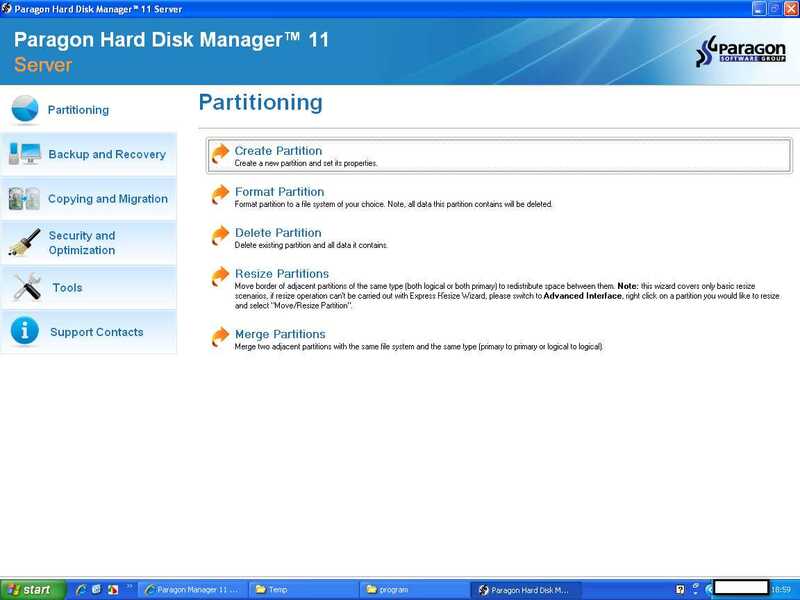 But still, is it "Paragon Hard Disk manager" OR "Paragon Partition Manager" ? Running Regsvr32 should work, but not *all* .dll actually *need* to be registered, and some of these will also "say" so with an error. It is paragaon Partition manager 11, (idiot me forgot the full tittle name).. I am going to try the dependecy walker suggestions above tonight when i get home. Hopefully this will give me more hints on what the problem is. Do review also the "old version" .script, maybe you find something. maybe you can post a request, soem of the most aficionados VistaPE fans may have a copy. MInd you there may be others "around", *somewhere*. But my portable one doesn't need any file to register and working well. That's why I've already mensioned that may be wrong version or something. Exactly, no need to register any file for Paragon Partition Manager 11 free edition. You just introduced another variable. "Free edition" (vs. "Server"). I've been using Paragon software many versions and editions with portable. No one is needed to register a file. So I thought logically, there should not need to register a file. Unfortunately, I don't have the version he expressed. So I can't prove in this state. Paragon HD Manager 10 Server. 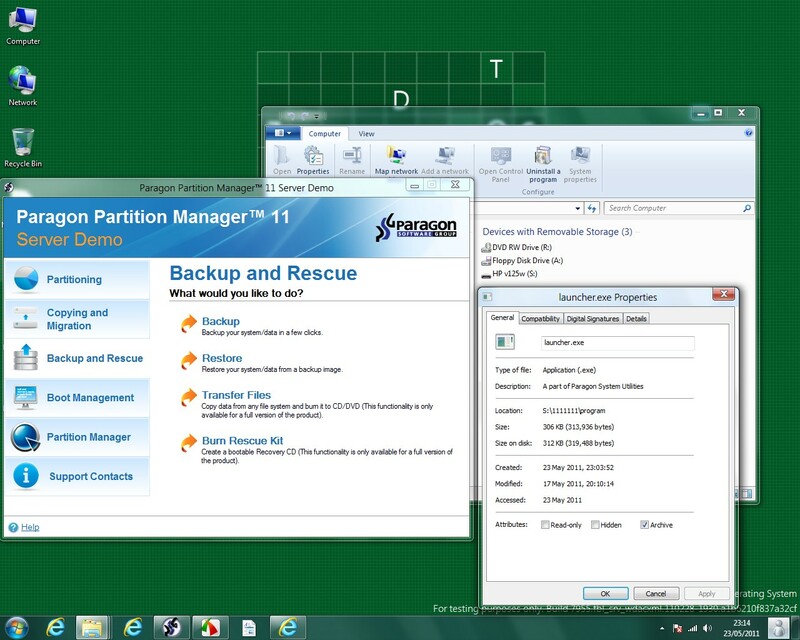 Paragon Partition Manager 11 free edition. That is a proof of my variables. Paragon Partition Server 11 Demo version. Why you don't post your .script's for these you have working? Maybe this way ylafont can spot what is missing from his one. It is a fun to play. If I told which files are needed straight away, it was not interesting like that. It needs only 2 files. I have no mood to create a script at the moment. But I did many in the past. You will also need to install a driver - hotcore3.sys - if you want Paragons hot processing to work. That one can be a challenge to get working in PE. PS - prgiso.dll is already in the program folder in later versions as I know. I think we are all right on this one guys, Aye Htay was correct there awas a file missing. MSVCIRT.DLL is not included in the installation of "Partition Manager Server 11 (not free)". I took me a little time to figure out it was this file as depenndacy walker was also reporting that other files were missing like msjava.dll. I had to go back and forth between machines to see what files were installed on the clean machine and which were not and then compared them to the one in liveXP. They were .Dll registry entries in the in the after snapshop of WinInstall. I imported then and one of those entry was HDM.DLL so i am not sure if it needed to be resistered. I am cleaning up the script file and removing the help and other stuff they is not needed. Will posted it, once i am done. thanks for everyone assitnace. I would have surrely not happened it you guys did not chime in. thank you. Edited by ylafont, 24 May 2011 - 05:27 PM. I took me a little time to figure out it was this file as depenndacy walker was also reporting that other files were missing like msjava.dll. Q. Why is MSJAVA.DLL showing up in yellow (missing module) and I get a "Warning: At least one delay-load dependency module was not found" message? A. The MSHTML.DLL module that was released with Windows XP SP2 and Windows 2003 SP1 has a delay-load dependency on MSJAVA.DLL. Missing delay-load dependencies are not a problem as long as the calling DLL is prepared to handle the missing module. Dependency Walker flags all potential problems as it cannot detect if an application intends to handle the issue. In this particular case, MSJAVA.DLL is an optional module, and MSHTML.DLL is prepared to handle it. This warning can be ignored. See the "How to Interpret Warnings and Errors in Dependency Walker" section in help for more details. Naah, don't feel bad , I would say that half the people that ever used Dependency Walker has fallen for that, including yours truly . Actually, I had used it on 2K for years without ever a problem, then the first time I had to use it on XP (already SP2) and I started getting the stoopid missing MSJAVA.DLL, it took me several hours before I realized that the info was there. I know it can most like use some improvements, But it works. I haven't gotten used to the scriting syntax. here is the script for Paragon Partion Manager 11, in the event anyone needs it.